The Kinrick o Eswatini is a wee kintra in sooth Africae, cried efter the Swazi, an it ligs atween Sooth Africae (tae the wast) an Mozambique (tae the east). Forby thon it ligs upo the eastren braes o the Drakensberg muntains. ↑ 2.0 2.1 2.2 2.3 "Swaziland". International Monetary Fund. 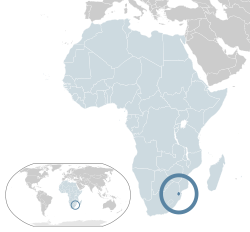 ↑ "Swaziland – Country partnership strategy FY2015-2018". World Bank. Retrieved 8 March 2015. Wikimedia Commons haes media relatit tae Swaziland. This page wis last eeditit on 25 Dizember 2018, at 15:42.